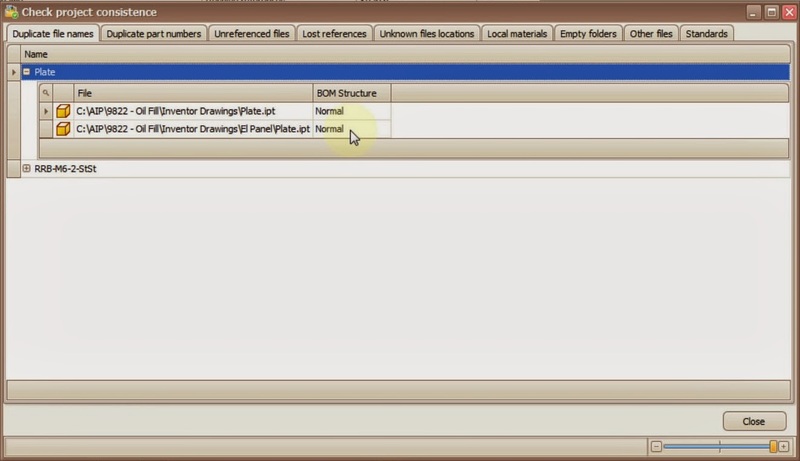 Today I am going to show you how to use the project/assembly verification tool on the mExtension toolbar. 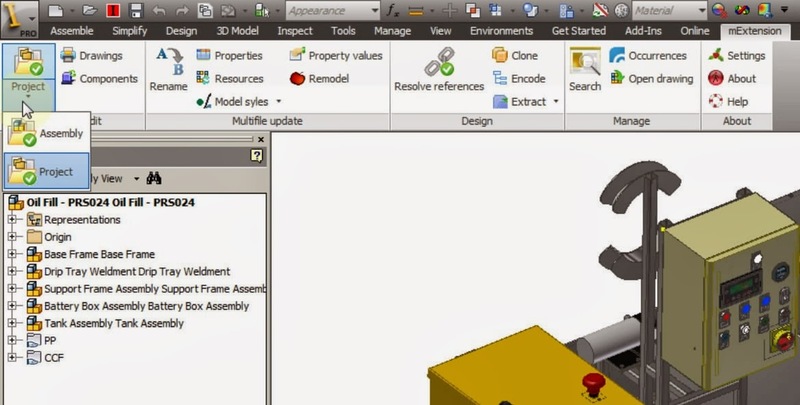 This will help you check your project or assembly for consistency and will help you clean it up before completion. If you use vault or some sort enterprise resource planning and management software to keep your files than you will love this tool. The Project Verification tool will check the integrity of the project while the assembly tool will just work against a selected assembly. 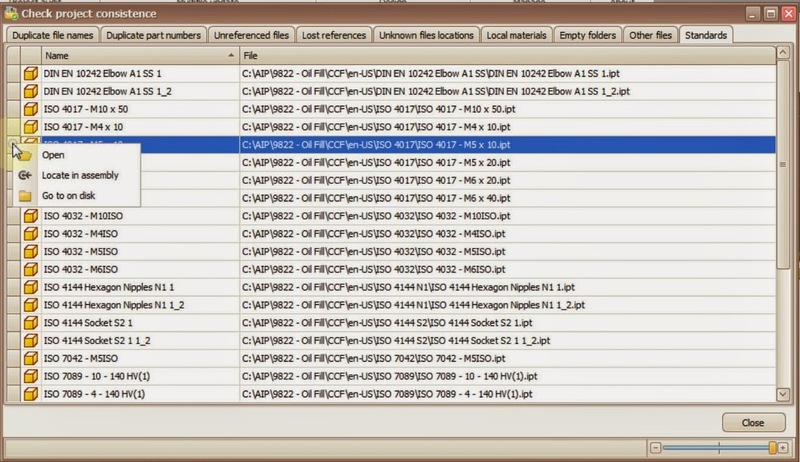 I have opened my main assembly ad selected the Project Verification on the mExtension toolbar. A window with multiple tabs will appear and we will discuss each and every in detail. 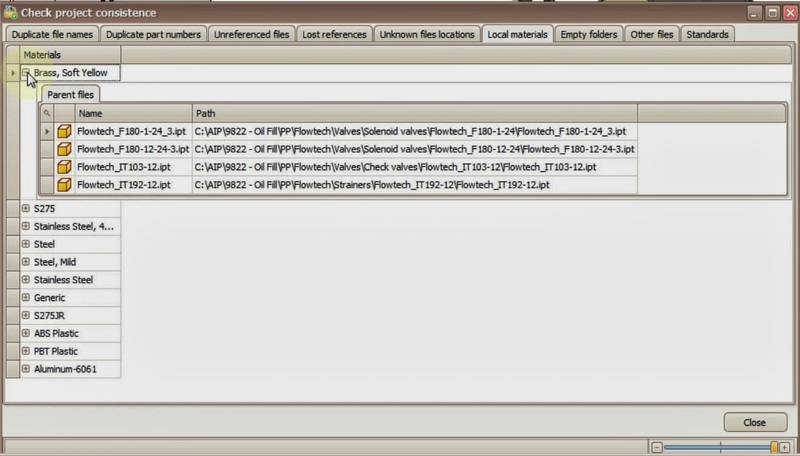 The first tab is the “Duplicate file names” and it shows you all the files with same name on the project folder. As you can see I have two sets of duplicates one wit name ”Plate” and one with name “RRB-M6-2-StSt”. When we expand plate we see that I have a file “Plate.ipt” in the main folder and one with same name in “El Panel” folder. With all of the results I can Open, Locate on disk, Locate in assembly. Let’s locate them in the assembly and make sure they are not the same, or that one can’t be used in both places. One is under the motor and the other is a lid hinge plate. The next set of duplicate file names are actually one and same but for the purposes of this demonstration I’ve placed one as standard from content center and another as custom on the working folder just to get more results on the project verification. Next tab is the Duplicate part numbers. I have 3 sets of duplicates, Plate, RRB-M6-2-StSt and Tray Retainers. Because I haven’t used the Codify tool on the mExtension toolbar to automate part number assignment, the models appear as created with default part number as description. Next tab is the unreferenced files and in here you will have all models that are not used in the main assembly (not called for). 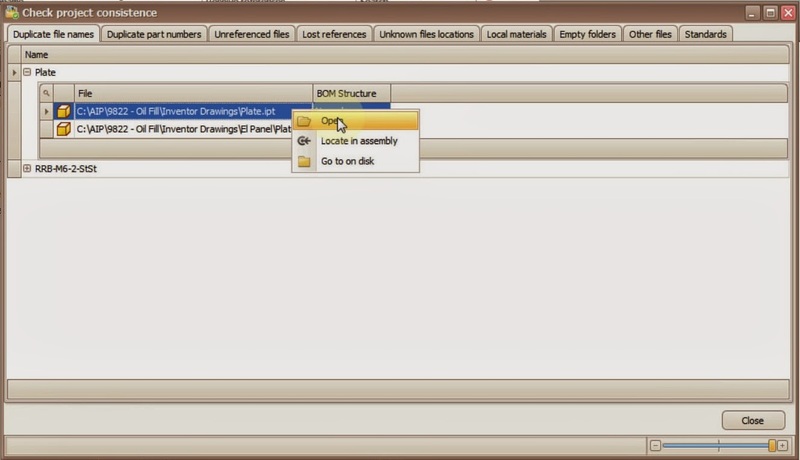 It is important that you use the project verification tool from within the main assembly. We can delete it, open or locate on disk, and because it was placed solely for the purpose of this demo I will delete it. Lost references are in the next tab and this will show you any models with missing references. 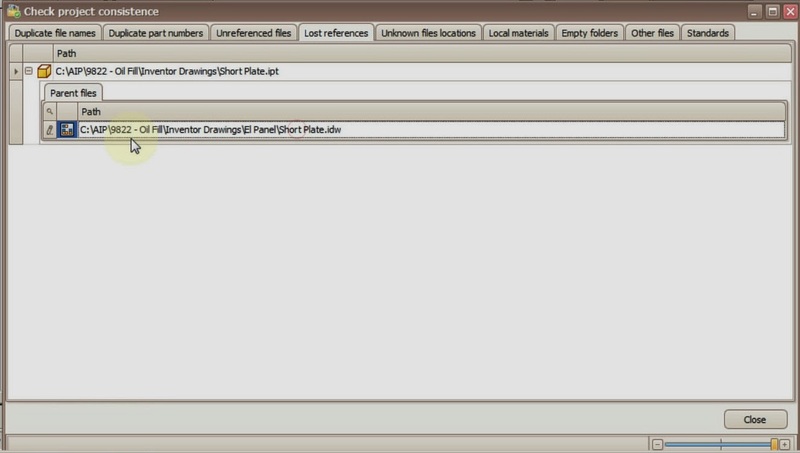 As you can see I have a drawing “Short Plate.idw” that is looking for a model “Short Plate.ipt”. Because I renamed the model without using the rename function on the mExtension toolbar the drawing lost reference with it’s model. Let’s use the “locate on disk” on the drawing to see if we can find the missing model. The missing model was renamed “Plate.ipt” and we need to open the drawing and point to the new part to fix it’s missing reference. The next tab, “Unknown file locations” will show you all files that are outside of the project search paths; not in workspace or in the libraries. These files will not be found next time you open the assembly. However you can use the “Resolve references” to fix them next time you open the assembly. 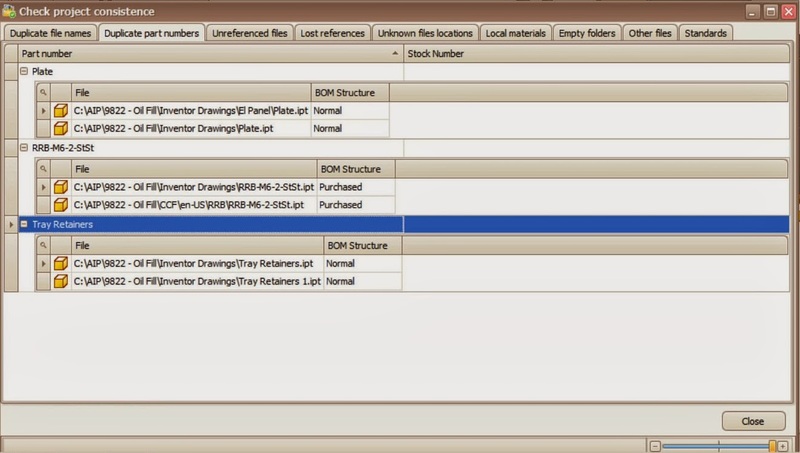 Local materials tab will show you all materials used in the project. This is a good list to review, for you can change materials from say “bronze” to “PTFE” or similar in order to keep the price of the project down. The empty folders list will show you all the empty folders in the project with the option to delete them from within this window. Other files tab will show you what other files you have in the project that you might want to delete in order to keep the project clean. I have a pdf file for an “isolator” that I needed to model and forgot to remove it from my project. I will use the delete option to clean it up. The standards list will show you all the standard Content Center components used in the project. This is useful if you want to keep your purchase list down. For example I have used M5x10 and M5x20 hex head bolt and I want to see if I can use just one of them. Let’s locate them in the assembly and see if one will fit the other. The M5x10 is used on the gas strut plate and I can’t make it 20 long because it will stick out to much. The M5x20 is used on the motor plate and I can’t make it smaller because it won’t reach the nut. Let’s try the assembly verification tool now. It is useful when you want to release for fabrication just part of the project and you want to check it’s integrity. Pretty much the same tabs, “Duplicate file names”, “Duplicate part numbers”, “Lost references”, “Unknown file location”, “Local materials”, Standard, but it also contains a different tab called “Cost estimation”. 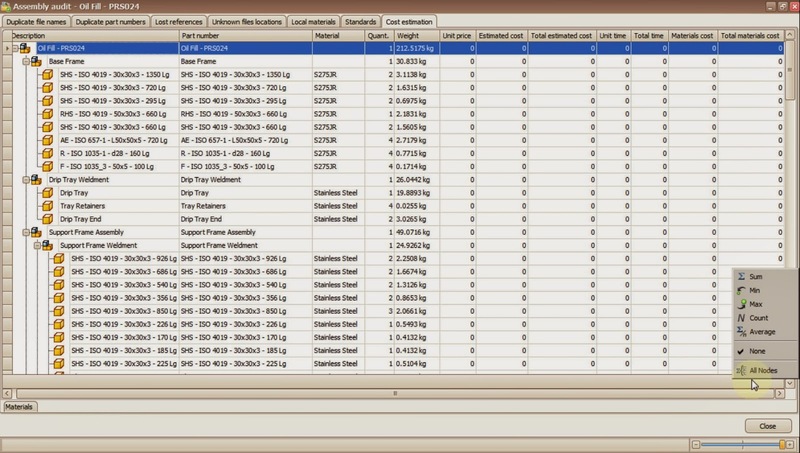 This list will show you weights and prices for components in order to estimate execution costs. On all columns you can apply filter, sort, as well as operations as Sum, Min, Max, Count, and Average. You can copy paste straight in excel or any other program via clipboard. This concludes my presentation on the mExtension toolbar Project/Assembly verification tool.